There is something wonderfully comforting about coming home to a warm meal ready to eat without any effort, even if you did in fact make it yourself. No matter what kind of day you had, you can right the wagon when you come home to a crock pot simmering with this warming soup. The spicy aroma seeps out of the cracks of your house, and gives you a warm and welcoming hug before you even walk in the door. 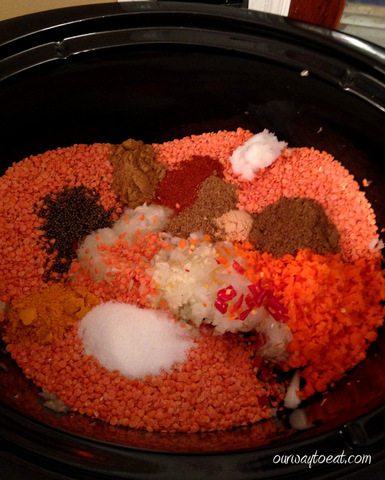 I like to put together a crockpot meal the night before the day in my week that most needs fixing. For me, that is Monday. I come home, fling open the door and say “honey, I’m home” and then singsong back to myself in reply, “supper’s ready!” This is a healthy, low fat, plant strong meal. It qualifies for all sorts of healthy eating buzz words: vegetarian, Meatless Monday, vegan, slow carb, plant strong and nutritarian. 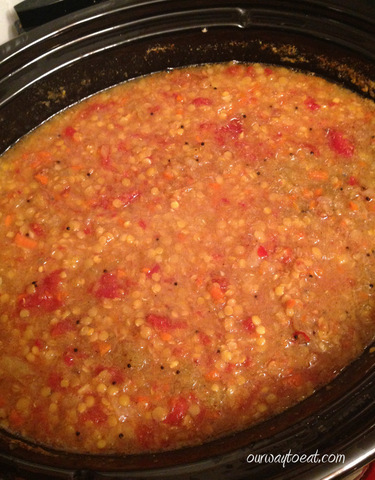 3 cups of red lentils, inspected on a white plate or platter, debris removed. 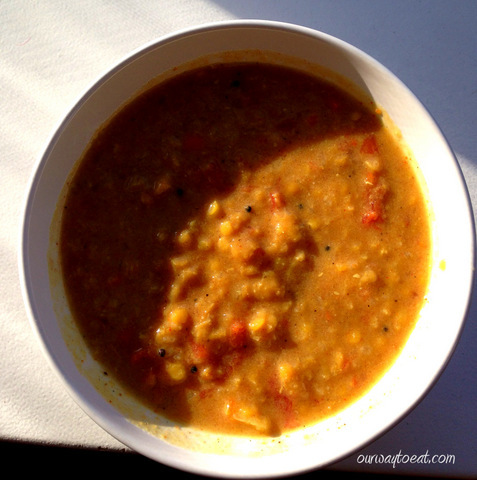 8 cups of water—really, it’s a soup that does not at all require stock! 1 cup of tomatoes, canned or fresh, chopped. 2 cloves of garlic, minced. 2 Thai chilies, minced. I used dried Thai Dragon chilies from my garden. Something similar is easily available at the grocery store. 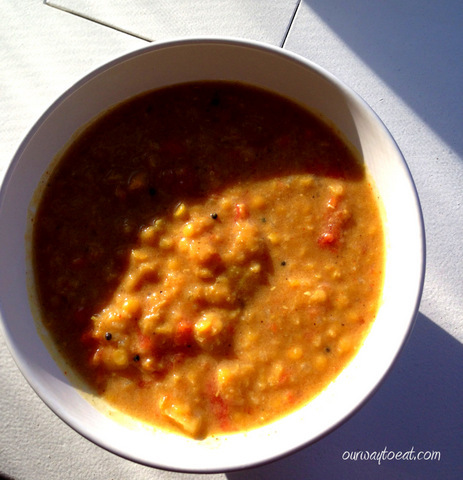 Optional additions – 1-14 ounce can of coconut milk –totally optional, gives the soup some creamy body, and the spices a place to hang since there is no other added fat included but the soup is lower fat and still wonderfully flavorful without it. 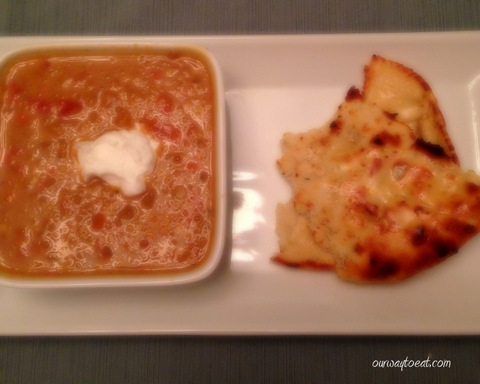 Serve warm with Greek yogurt or sour cream to garnish, and warm Naan or Basmati rice on the side. One of the downfalls of loving to cook and eat is getting into bad habits of having too much of our favorite foods, too often. Like many concerned eaters, we’ve recently watched the documentary, Forks Over Knives, and what we took away was a desire to go “Plant Strong” in our diet. To us, going Plant Strong means that meat (for Bjorn), complex carbohydrates and processed foods (for both of us) are playing a smaller role in our meals. We’re also aiming for scaled back portions when we do use these ingredients. We want to do this for our health, to shake off some bad habits we’ve acquired and to shed what we carry that comes along with those bad habits. We’re trying to put whole fruits and vegetables the center of more of our meals. We’re gardeners, veggie lovers and avid Farmer’s Market shoppers, so this isn’t new. We have just renewed our focus on putting the nutrient dense, delicious natural foods in the starring role they are meant to play in our diet. I am also trying to take little shortcuts and make substitutions to reduce the fat and salt used in our cooking, without sparing flavour. So far, we’re feeling good about the changes and I think we’re enjoying more variety and creativity in making a shift away from our pizza-pasta-burger routine we fell into over the summer. I love pasta a lot so we will still eat it, but a smaller amount, and prepared in a more thoughtful way. Tonight, our supper took the form of a lightened up, veggied-up, cobbled-together concoction with some characteristics that harken back to a traditional tangy and rich Russian-style Mushroom Stroganoff. The recipe was simple, and came together quickly. I started by sautéing two small yellow onions with non-fat cooking spray, and just a little bit of olive oil. Then, I added chopped button and cremini mushrooms. 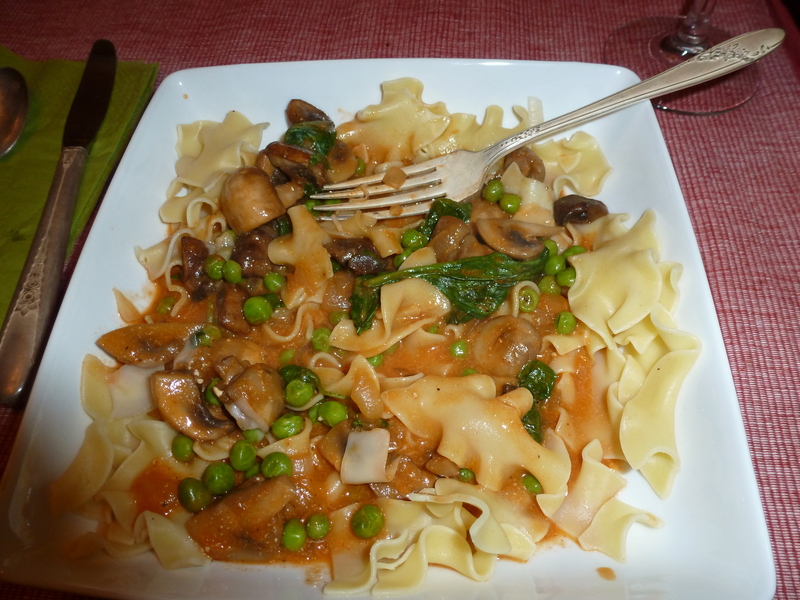 I love mushrooms and can hardly resist adding them to every pasta meal I make, along with peas and spinach. They go with practically every sauce, and taste great together! Bjorn, being pleasantly open-minded as an omnivore has no problem foregoing the traditional beef in the stroganoff on a run-of-the-mill Tuesday night. To make the sauce, I loosely followed a Beef Stroganoff recipe, minus the beef from on of favorite my blog-haunts, Skinnytaste, using a can of tomato soup. We didn’t have Worcestershire Sauce in the cupboard, but after a quick Google search, Bjorn informed me that soy sauce with a shot of hot sauce would do the trick as a stand-in for Worcestershire Sauce. I used Braggs Liquid Aminos and Sriracha, aka, Rooster Sauce. We like deeply flavored sauce, so I added a healthy shake of paprika and some crushed garlic and let the sauce cook a bit. After cooking the onions and mushrooms and adding tomato soup the sauce was pretty thick, so I used some low sodium vegetable broth to thin it out a little. I cooked egg noodles separately in lightly salted water and when they were well on their way to al dente, I added peas to the sauce pan. When the noodles were nearly cooked, I stirred in some low-fat Buttermilk and a few generous handfuls of fresh spinach leaves into the sauce. Buttermilk gives the creaminess and tang of sour cream you want with a Stroganoff, but is low in fat. I had it on hand because I am planning to make another recipe that subbed buttermilk for a higher fat dairy product, so that is what I used, but low-fat sour cream would have been fine as well. 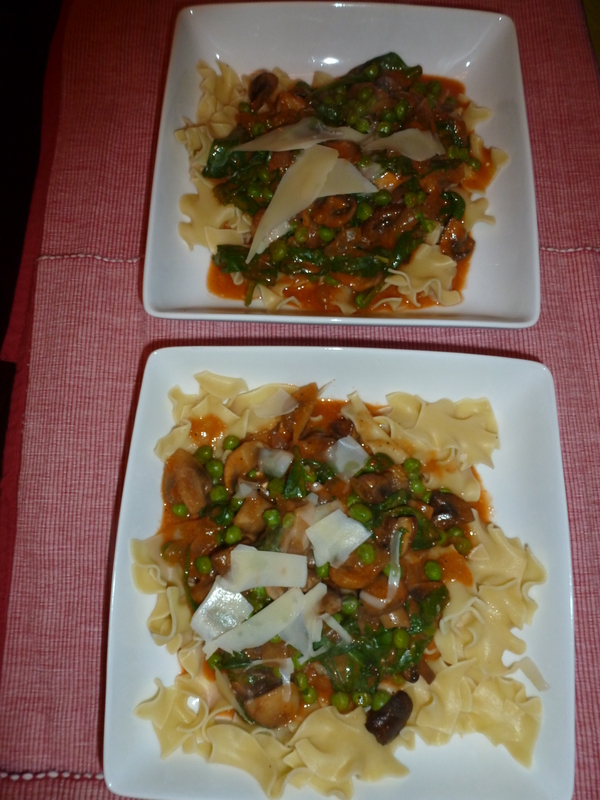 The spinach and peas don’t belong in a traditional stroganoff, but they sure taste good! We enjoyed this cozy, richly flavored, savory dish with a little shaved parmesan and we both found the supper to be tasty and satisfying. With a few little tweaks to our cooking and eating habits, in time, we will see a positive result, I think. I also think we’ll enjoy some delicious suppers in the meantime.